Doosan showed the updated 30-ton articulated truck DA30-5, that received new front suspension and rear tandems similar to the heavier DA40. The front leaf spring suspension was replaced by the new hydro-gas, self-leveling suspension that enhances driver's comfort and smoothness of movement, especially when the bed is empty. The rear tandems is also new and designed in-house. Some changes took place inside the cabin. So big-boot drivers will be pleasantly surprised by the increased distance between the pedals. New air vents in the floor will keep the optimum temperature inside the cabin even during a hot, sunny day. A new display panel features larger icons for easier readability. Minor changes are also made to controls: retarder lever, electric mirrors, optional second camera, windshield wipers. 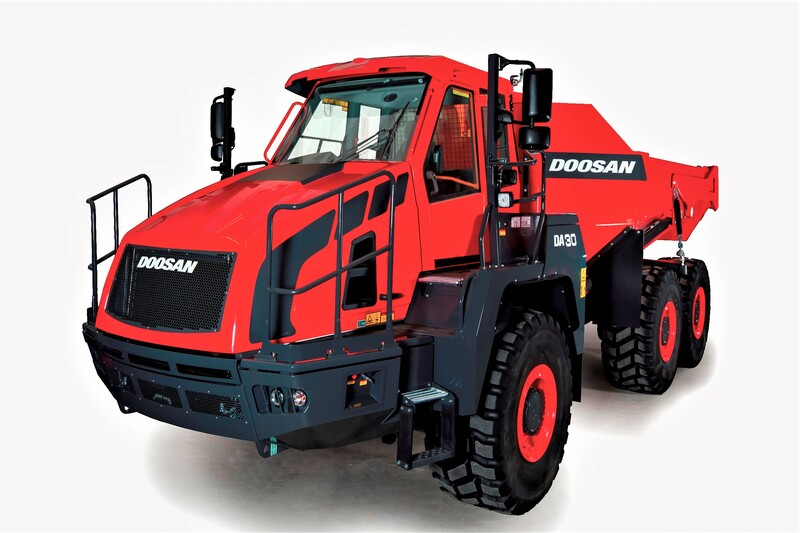 The Doosan DA30-5 is powered by a 370-horsepower Scania diesel, joined with a ZF gearbox. The engine is equipped with SCR and EGR systems to reduce emissions. Servicing improvements include a new battery cut off that is controlled from ground level. There is also a diesel exhaust fluid (DEF) purge-completion function to make sure the DEF is fully drained from the lines even after the engine is shut off.